Five Premier League clubs are facing the threat of being hit with a transfer ban as part of Fifa’s investigation into the signing of foreign players under the age of 18. Chelsea are one of the clubs and a report by French investigative website Mediapart has claimed that Fifa’s Integrity and Compliance unit have internally proposed a two-year transfer ban on the London club stretching across four windows. Mediapart are one of the organisations publishing documents obtained by Football Leaks. Other than releasing a short statement in which they insisted they are cooperating with Fifa, Chelsea would not comment on the report or the case. It is believed at least four other Premier League clubs are under investigation and some of the biggest clubs in Europe are also being looked into. A Fifa spokesman said: "As communicated in September 2017, investigations were opened concerning the club Chelsea FC as well as other English clubs in relation to potential breaches of the Regulations on the Status and Transfer of Players. The proceedings are ongoing and, to date, no decision has been passed by the Fifa judicial bodies. Thus, the clubs are to be presumed innocent unless decided otherwise. No further information can be provided as the cases are ongoing. Any update will be communicated in due course." Fifa rules prohibit the international transfer of players under the age of 18 unless their parents have emigrated for reasons not connected to football or both the player and club are based within 50km of a national border. The only other exception is for transfers within either the European Union or European Economic Area, where the minimum age is 16. In those cases, clubs must still ensure that the player continues his education and studies for an alternative career, as well as making sure he has a high living standard. 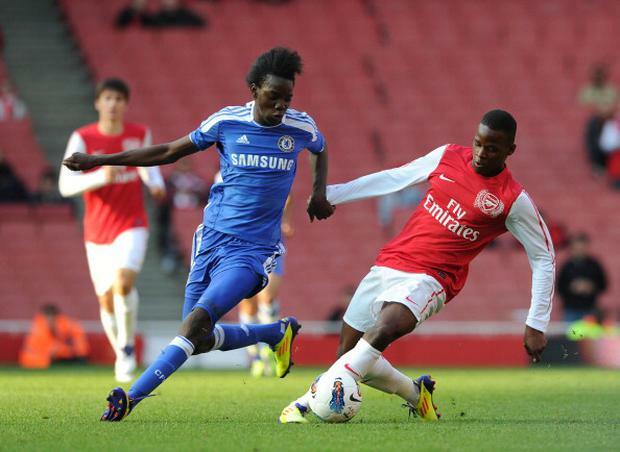 The investigation into Chelsea includes the signing of Bertrand Traore, who was pictured playing in an Under-18s game against Arsenal when he was only 16. The identities of the other four clubs under investigation have not been revealed, but Fifa has previously confirmed Manchester City’s activities involving the signing of youth players were under review, even though the club denied any knowledge of the situation. Mediapart’s report claims an internal Uefa document indicates that, between 2013 and 2017, City (28), Manchester United (27) and Arsenal (19) were among the clubs that signed the most minors, along with Atletico Madrid (52) and Juventus (19). United are not thought to be under investigation by Fifa. Atletico and Real Madrid have both been hit with transfer bans for breaching Fifa rules over the signing of minors. Atletico appealed the decision, but their two-window embargo was upheld. Real’s punishment was halved from two transfer windows to one. Barcelona were also fined 450,000 Swiss francs in 2014 for irregularities involving the transfer of 31 minors between 2005 and 2012. Chelsea have been under investigation for signing 14 under-18 players since it emerged the club broke transfer rules in signing Burkina Faso forward Traore before his 18th birthday in 2014. Mediapart have reported Fifa’s Integrity and Compliance unit have recommended the Blues should be banned from signing players for one transfer window for the Traore signing, and three further transfer windows for 13 other offences, plus a fine of £384,000. It is unclear whether or not the cases against Chelsea or the other four Premier League clubs are close to completion, with no timescales being given. Traore officially signed for Chelsea in 2014 at the age of 18, but the club later admitted that they acquired a first-refusal option to sign him. Mediapart claim the agreement was made with his mother in April 2011 for £155,000, with a further £13,000 due to his club AJE Bobo-Dioulasso, chaired by the player’s mother. It was also alleged that Chelsea paid for Traore to attend the £20,000-a-year Whitgift School in Surrey. Following loans to Vitesse Arnhem and Ajax, Traore was sold to Lyon for £8.8million in June 2017 after making 16 first-team appearances for the Blues and scoring four goals. Chelsea were banned from signing players for two transfers windows in 2009, over their conduct in the deal that took the attacking midfielder Gael Kakuta from Lens to Stamford Bridge in 2007, although the penalty was overturned on appeal. City, Liverpool and Everton have been punished by the Premier League for breaches of the rules regarding the signing of domestic academy players. Everton were last week banned from signing academy players and fined £500,000, while City and Liverpool were both hit with fines and bans. It is understood Chelsea do not advise players on which bank accounts to pay their salaries or image rights into.